Juicy, provocative latest installment in the comprehensive life of a self-destructive genius. 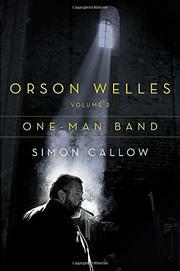 In his first two volumes of the life of Orson Welles (1915-1985), actor and author Callow captured the scope of a life that always seemed to promise more than it delivered. In The Road to Xanadu (1996), Welles was the boy genius whose Midas touch literally transformed theater, radio, and then film, reaching the pinnacle of his life at the age of 25 with Citizen Kane. In Hello, Americans (2007), Callow charted the way down, exploring how Welles’ sprawling ambitions ran up against both studio interference and his own restless inability to see projects through to the end. During the period recounted here (1947-1964), Welles fell into the pattern of his adult life: constantly trying to get a new play or film off the ground and taking acting jobs to help finance them. The results were ridiculously mixed, with success and failure jostling each other from year to year. Welles made quirky box-office duds (Othello, Mr. Arkadin), staged an ambitious version of Ionesco’s Rhinoceros, and got fired by Laurence Olivier. He also made a classic film noir, Touch of Evil, and a long-gestating masterpiece, Chimes at Midnight. Welles thought of himself as Falstaff, but he seemed a good deal closer to King Lear: a royal in exile, howling at the winds as well as actors, crew members, studio heads, and anyone who crossed him. He was, also, a paradox to the critical establishment: a failure to his countrymen, a hero to the Cahiers du Cinéma crowd. Callow, with his own extensive theatrical background, remains Welles’ most astute observer, with an unerring sense of both his subject’s brilliance as a visual artist and the comparable limitations of his (often hammy) performances. Welles rightly imagined that people would never stop writing about him after he died. Callow continues to set the standard in this increasingly crowded field.